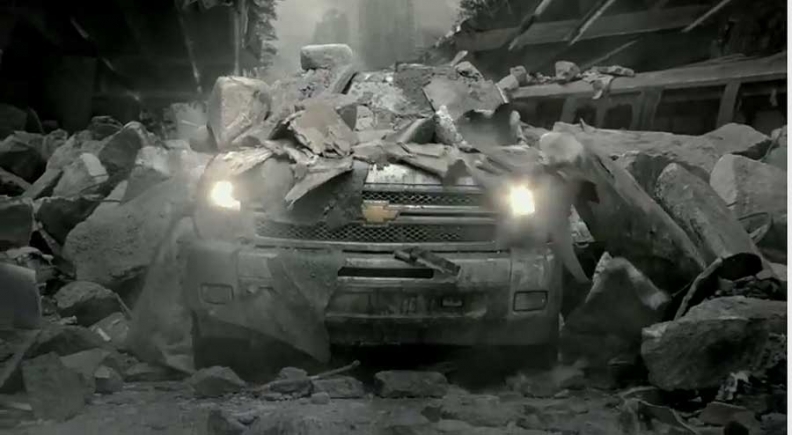 GM's Chevy Silverado ad ran in the first quarter of the Super Bowl this year -- and was one of five spots that Chevrolet debuted during the 2012 Super Bowl. NEW YORK -- Not long after announcing that it will stop advertising on Facebook, General Motors said Friday it would not be a sponsor in the Super Bowl in 2013 either. What's going on here? Deep-pocketed marketers typically follow Theodore Roosevelt's adage of speaking softly and carrying a big stick. GM is still carrying a massive weapon -- millions of advertising dollars -- but it's talking about its marketing decisions to anyone who cares to listen. "We understand the reach the Super Bowl provides, but with the significant increase in price, we simply can't justify the expense," said Joel Ewanick, the company's global chief marketing officer, in a prepared statement confirming remarks he made to The Wall Street Journal. The company would probably like its actions to spur a debate on the price of advertising and the ad efficiency of specific media outlets, but there may be other reasons why the automaker is using a bullhorn to discuss its tactics. Just a few years after taking U.S. government funds to keep it from going under, GM is still looking to keep costs down, and Ewanick has been on a mission to wring $2 billion over five years out of marketing costs for the company's flagship Chevrolet. The announcements also come just as the annual upfront marketplace -- where ad buyers strike deals for commercial time in the coming TV season -- is getting underway, and could be meant to signal an aggressive pose heading into negotiations. Last year many auto advertisers spent freely at the upfront partly in an effort to make sure they would reach TV viewers even if the NFL lockout affected the football season. Like Facebook on the eve of its IPO, the Super Bowl is a splashy target for GM. The cost of advertising in the gridiron classic has soared in recent years as marketers place more value on live sports and broad, communal events that draw the kinds of big audiences that are becoming harder and harder to assemble. Each of the past three games has broken the record for the most-watched event on TV. NBC commanded an average of $3.5 million for a 30-second spot in this year's game, and Les Moonves, CBS's chief executive, recently said he thought CBS's 2013 broadcast should command $4 million. One ad buyer familiar with the pace of negotiations suggested marketers looking to buy multiple Super Bowl spots with CBS could get them for between $3.7 million and $3.8 million each, with longtime sponsors getting a discount to that price. CBS declined to comment. Despite its colorful actions, GM isn't going to be spending less on advertising going forward, a company spokesman said. "Our overall spend will remain flat compared to last year," said spokesman Tom E. Henderson. "As we've said all along, we're continually reevaluating our spending and will maintain a strong presence in all mediums." GM has winnowed its overall spending down in the recent past. GM spent approximately $1.78 billion on traditional media and online display advertising last year, according to Kantar media, a 16.1 percent decline from the $2.13 billion it spent in 2010. Those numbers don't account for several categories of new-media advertising, including paid-search ads. Even so, the company's recent announcements about Facebook and the Super Bowl affect relatively paltry amounts -- just $13 million to $14 million. That would get GM just six or seven 30-second spots on NBC's "Sunday Night Football," hardly enough to drive millions of consumers to their local dealership. And GM is still involved in some pretty prominent, and costly, marketing efforts. The company has negotiated a deal for its trucks to appear in the glitzy remake of "Dallas" slated to run on Time Warner's TNT in June. GM is in the middle of negotiations with CBS to ensure its Chevrolet vehicles appear in the third season of "Hawaii Five-0," according to a person familiar with the situation. That deal is likely an expensive one, because it calls for GM to be the sole automotive sponsor of the program, which means that CBS must turn down ads from competing automakers who might like to advertise in the show. GM is trying to be very disciplined in its marketing efforts, said one executive familiar with the situation. Its ad choices hinge less on costs and more on results. "It's not all about CPM," this executive said, referring to the cost of reaching 1,000 consumers, a common measure in ad negotiations. "It's about what's going to move autos out of the show room." GM's move is not likely to have an effect on Super Bowl advertising. Indeed, the company, which has a long history of supporting the event, pulled out of it in 2009 when its financial issues threatened to overwhelm it. The game still took place. And it took place in 2010 when another flagship sponsor, PepsiCo, decided to place ads for its beverages on the bench as it tested a campaign based largely in digital media. Both marketers subsequently returned.